This is the story I’ve been too nervous to write for 25 years. And this is the story I have to write because it’s the story so many people live and are too afraid to tell. I always have been — I remember having crushes on girls as early as age 9 — but I didn’t know that was a thing for a very long time. I didn’t know I could like girls for a very long time. And even after I knew, it didn’t quite occur to me that I did. At 34, I finally told my parents that I had had a girlfriend when I was 19. It took me 15 years to tell them. Why is that? My parents raised me to be open-minded, to be kind, to be loving, and when all else failed, to be tolerant. I wasn’t raised in a hateful home, and I wasn’t raised in a home that told me I had to be straight. But I also wasn’t raised in a time that overtly offered alternatives. Nobody ever talked about what to do if I was queer. Nobody ever approached a discussion like that with me. And I don’t blame my parents one bit. I’m sure it never occurred to them. It still doesn’t occur to a great many open-minded, loving parents. I think a lot of parents assume they’ll know. That if their child has queer tendencies, they’ll be aware of it. But that’s not how it works. It’s not always gay or straight, one or the other. I did like boys. I dated boys; I talked about boys; I thought about boys. But I thought about girls, too. I just didn’t talk about that part. I didn’t think I should. I assumed that everybody had those thoughts and that we weren’t supposed to discuss them. There were very few kids who were out when I was in high school in Northern Idaho in the mid-’90s. Those who were had to deal with a lot of prejudice and hatred and ignorance. I was friends with a few kids who were out, but I was a white, middle class girl who dated boys, and I didn’t think the abuse my friends suffered really had much to do with me. I supported them and defended them, certainly, but I could have tried harder. I should have tried harder. I wish I had tried harder. I could just as easily have been defending myself. It wasn’t until I was in college and met L that it occurred to me that I had genuine attractions to girls, too. L and I lived in the same dorms, and we clicked immediately. She was smart, witty, kind and beautiful, and I enjoyed her company. We became friends, then close friends, and we spent much of our time together. We’d walk each other to class and eat our meals together in the cafeteria and spend evenings watching movies in each other’s dorm rooms. I was dating boys here and there, so she assumed (as did I) that I was straight. But I knew she was gay. It took a while for her to tell me, and I could tell she was scared when she did, but it wasn’t a surprise. As we continued to spend time together, I began to notice I was attracted to her. I wanted to find reasons to be close to her, to touch her, and she seemed to feel the same way. We began to sit closer and playfully tickle or hold hands as we walked around campus. Then we began to snuggle when we watched movies, wrapping our arms around each other, heads on each other’s chests. One night, we lay on her bed, arms around each other. My head was on L’s chest and I noticed her heart beating quickly. Mine was doing the same and I looked up at her, smiling. Before I realized what I was doing, I kissed her. It wasn’t planned — it just happened. She kissed me back — a soft, sweet, slow kiss — and when I pulled away, she looked shocked. I smiled at her and said, “Oops?” and put my hand to her face. She closed her eyes, but she was anxious. She didn’t look as happy as I felt. I was the only person on campus who openly knew that L was gay, and she thought I was just testing the waters. Which I was, I suppose. But it wasn’t out of curiosity. It was out of genuine emotion. I cared for her. I was attracted to her. It took a long time for me to explain it all, to convince L that I wasn’t just playing around, and we began dating. Eventually, we moved in together, with our relationship lasting nearly two years. It wasn’t perfect. Our closest friends knew about us, but she was terrified to tell anyone else. She was petrified of what they would think of her, what they would think of me and how everyone would react. Our friends were loving and supportive, if surprised, and for the most part treated us exactly as they always had. But everyone else was different. L didn’t want to tell anyone outside of our close circle. She didn’t want anyone to know about us. Once, when we went to an Ani DiFranco concert in Seattle, she wouldn’t hold my hand, despite being surrounded by queer couples. The whole thing baffled me. I didn’t quite know what to do with myself. Still, I followed her example and I didn’t tell my parents. L didn’t want me to. In fact, I never told them until a political discussion led to my desire to point out that I was part of the group that needed defending. That I was other, too. I was terrified. After 15 years, finding a way to gracefully bring it up was wildly ungraceful. There’s no easy way to say, “Hey, remember that friend of mine that I was always talking about my freshman and sophomore years in college? Yeah… we were totally f***ing. And I loved her.” It’s just not really something that works easily into conversation. And frankly, I was still worried — after all that time — about what kind of reaction I’d get from my parents. It’s strange being an in-between. It makes people uncomfortable. But I’ve managed to avoid most of the hard stuff because I haven’t talked about it with anyone that might flinch. I’ve always been able to pass as straight because, to most people, I always have been. I’m married to a man. I have two biological children with him. I had boyfriends all throughout high school and some of college, and a lot of people never knew about L because she didn’t want anyone to know. So I did what she asked. But it made me feel false. I am probably more heterosexual than homosexual — I’d likely be a two on the oh-so-famous Kinsey sexuality scale — but I don’t fall neatly into the gay or the straight box. And that’s the thing about the inability to put people into the properly defined box — it terrifies people. For whatever reason, there’s this desperate desire to be able to categorize. Woman or man, gay or straight, Republican or Democrat. Anything in the middle freaks everyone out. But so few of us live in absolutes. The majority of us live somewhere in the gray area. The gray area is what makes us interesting. It’s what makes us unpredictable and beautiful and complex. This desire to shove everyone in one box or another makes everything harder. What would happen if we left a little wiggle room for everyone? What would happen if we opened up the possibility of other to everyone? What would happen if we stopped talking to our children in gender normative and heteronormative ways? What if we stopped assuming what people’s lives should look like? What if we just let people be and swam around in the Walt Whitmanness of it all? After all, we contain multitudes. I worry that it will never happen. People are so uncomfortable with ambiguity and the unknown. But I want to see it happen. I talk to my kids about loving whomever they want, and when they get a little older, I’ll tell them it’s OK to be attracted to men or women or both, like me. I honestly don’t know if my parents will be comfortable with that. 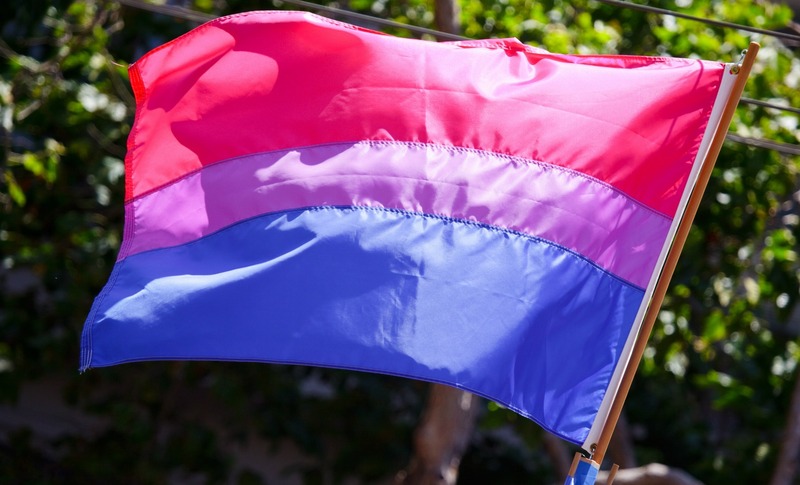 I don’t know if they’re currently comfortable with their child identifying as bisexual. I don’t know what most people will think. I know there will be some trolling and some hate language after this is published for all kinds of reasons. I know this. The gray area makes people uncomfortable. But it’s where we live. And it’s time to celebrate that.